Lay the legs skin side down on a cookie sheet or in a large dish. Sprinkle the meat with the salt, herbs and garlic. Let marinate in the refrigerator for 12 to 24 hours. After marinating, gently rinse each leg under cold water to remove excess salt. Pat dry. In a large pot, melt the duck fat over low heat. Add the duck legs. The legs must be completely submerged in the duck fat while cooking. Let simmer on the stove or in the oven at 140˚C (275˚F) for 2½ hours. Remove the legs from the fat and lay on a cookie sheet. Broil uncovered in the oven for 5 to 10 minutes. 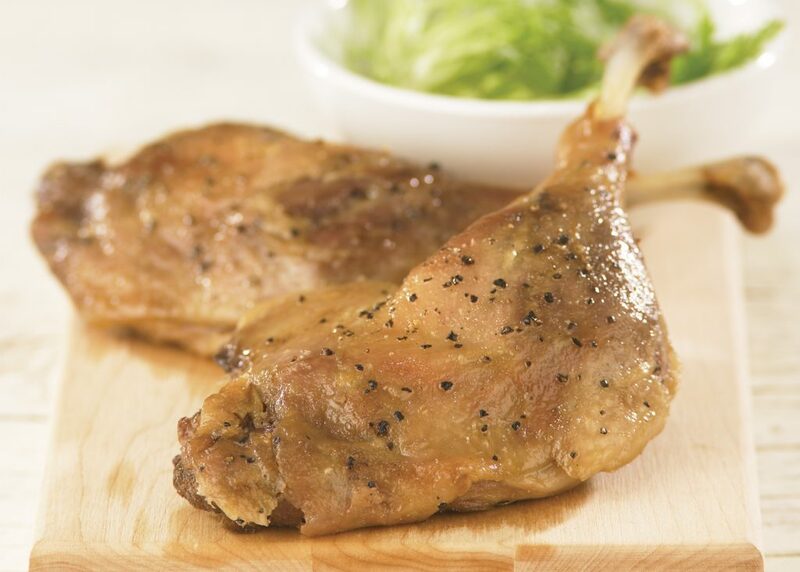 Duck legs confit can be served in a salad, stew or paella, with green vegetables or pasta. 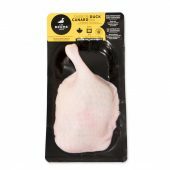 Duck legs confit can be kept in the refrigerator for 3 to 6 months if completely covered in duck fat. They taste best after 2 months. Once the fat begins to cool, filter using cheesecloth to remove all meat particles. The fat can be reused up to 5 times. Check the best before date on the package for shelf life. Can be frozen for up to one year if frozen before the best before date.